The UCSC chapter of Global Brigades, founded by fourth-year students Ida Shahidi and Daniel Truong, addresses problems such as medical care, access to clean water and microfinance in developing countries. Photo by Devika Agarwal. Heather Nicholson wouldn’t have predicted two years ago that she’d spend a week of summer pulling out teeth — but she did. Nicholson, a fourth-year community studies major from College Eight, had the chance to provide medical care to residents of Honduras last June along with other student members of the UC Santa Cruz chapter of Global Brigades. Global Brigades, the world’s largest student-led international development organization, is a nonprofit with chapters in many states. Global Brigades is the overarching name for nine types of brigade, each of which addresses different issues that face rural communities in Central America. The UCSC Global Brigades chapter took its first trip to Honduras last year with the Medical Brigades, but this year it has expanded to include Public Health, Water and Microfinance Brigades as well. With Medical Brigades, students set up a temporary health clinic and get the chance to actually treat incoming patients and administer medicine. Students also fundraise for medications and recruit doctors before leaving. “A lot of people you’ll see have never been to a doctor or have to walk far distances on foot,” said Ally Barnes, a member of the Global Brigades Empowerment Team who came to speak at UCSC. Thirty percent of Hondurans receive no health care, and 53 percent of the population lives below the poverty line, according to the World Health Organization. “You really see the impact you’re making … They really care that you’re there,” said College Eight fourth-year Ida Shahidi, co-founder and co-president of the UCSC chapter. 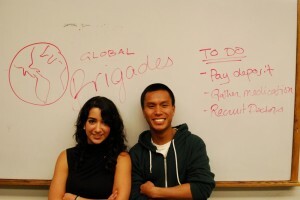 The UCSC chapter of Global Brigades was founded last year at by fourth-year College Eight students Shahidi, a bioinformatics major, and Daniel Truong, a neuroscience and behavior major. Shahidi first learned about Global Brigades when she missed her plane ride home from a vacation in Costa Rica. On the next flight she sat next to the president of the UC Santa Barbara Global Brigades chapter and learned about the organization. Shahidi was immediately interested to see if Global Brigades existed at UCSC. Shahidi asked Truong if he would be interested in co-founding the organization at UCSC, and he agreed. “It’s a lot of work, but it’s fun,” Troung said of leading the group. Together they are responsible for organizing fundraisers, recruiting students and doctors and making travel arrangements. “It’s one of those experiences you never forget. The group of students who went got along really well. Everyone worked really hard,” Nicholson said of last June’s trip. Global Brigades focuses on bringing sustainable solutions to impoverished communities, while respecting local culture. “It’s important that the people are a part of these changes and they’re educated to continue them. It’s a process of development,” Nicholson said. Each brigade provides resources and education to address various problems that result from poverty. While students in Public Health Brigades work with individual families and build things like concrete floors, latrines and clean burning stoves, Water Brigades work to sanitize water and provide water storage systems. Global Brigades is hoping to start an environmental chapter soon at UCSC, and increase student involvement this year. Global Brigades also provides education about sanitation practices. According to Global Brigades participants, many diseases that plague developing countries like Honduras are preventable and are a result of parasites from lack of clean water or flooring. “Public Health addresses the issues that cause the problems that are seen in Medical Brigades,” Nicholson said. The Microfinance Brigades provide donations to a community credit union that then makes a “micro-loan”, sometimes as small as $100, to an entrepreneur to fund their business. Often, successful entrepreneurs donate money back to the credit union, providing other community members with start-up funds. Microfinance has been successful in other developing countries, including many in South America and Africa. It is seen as a sustainable, long-term solution to poverty, as it funds businesses that can provide a person with a livelihood forever while teaching accountability. Students involved in Microfinance Brigades use their own money as loans and choose who they want their funds to go to. Katrina Luna, a fourth-year molecular, cell and developmental biology major from Cowell College, plans to participate in Medical Brigades this summer. Non-students and students from any major are able to participate in the June trip to Hunduras with the UCSC chapter of Global Brigades. For more information about the trip and the organization, go to http://gmbslugs.weebly.com.